Last week's Star Meter question was 'Who is the sneakiest housemate?' Africa has answered that question, and the first time someone other than Tayo has won the fans 'appreciation' award. Fighting off stiff competition, Macky2 seems to be playing his game under the radar and quietly manipulating his way towards the ultimate goal of USD300,000. 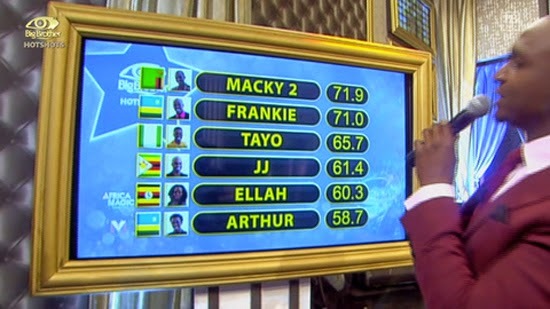 He beat off stiff competition from Frankie and Tayo, who also garnered a lot of airtime across social networks. Macky2 will surely enjoy his fans prize; however, it will also bring him and his strategy into focus. How will this affect his game plan moving forward? This week's Star Meter question is "Which Big Brother Hotshots housemate is the laziest?" One person was not allowed to be lazy during this week, was Idris who was punished Biggie for destroying a door over last weekend. Is this a sign that the housemates are starting to feel the growing pressure in the house as they move towards the end of the game? The rules are specific and strict in the house, and Biggie will not tolerate any deviation from the rules as Idris found out, and it appears as if the rest of the housemates took note. Butterfly sleeps most times, so she is the laziest.